I *was* planning on writing about Gillie’s in Blacksburg, but it appears that sanding all of the woodwork in our 1928 house (two floors full of rooms) has taken over my life. 10 pm and I just ate. But at least it was some darn tasty take-out Chinese food from Beijing Restaurant in Roanoke. For $6.25 I got a quart of Broccoli in Garlic Sauce with a pint of rice. 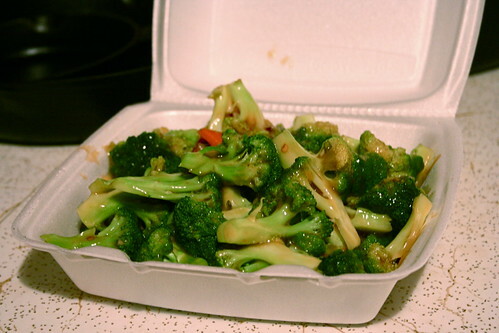 Crisp, lightly cooked (but cooked enough broccoli) in garlic sauce (not too thick, not too cornstarchy)–you can’t beat it. Plus it’s a Chinese restaurant in the same building as a gas station and it’s owned by Hondurans. Easy and delicious, and now I’m going to hit the sack. Hopefully a “real” post tomorrow! That looks way healthier than any Chinese food I have ever gotten. Hope your finished sanding soon! I am from Blacksburg, VA and got super excited when I saw this post. =) Yay Roanoke!